David Woodruff makes Cranberry dryers work better and racing cars go faster. He once gained a heap of horsepower for a Bonneville Salt Flats racing car by re-designing its hood scoop. Woodruff is best known in the racing ranks as Woody and his company is called Aero by Woody (www.designdreams.biz). 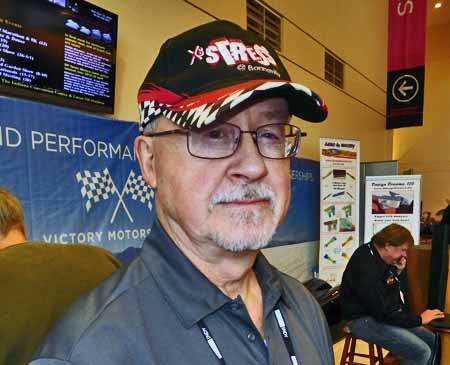 "I do primarily what's called CFD," Woody told Second Chance Garage during the Performance Racing Industry (PRI) Show in Indianapolis. "That stands for Computational Fluid Dynamics. If you have a car you plan to put in a wind tunnel, I can put it in a digital wind tunnel and save you lots of work and money." David Woodruff is better known as "Woody" to people in the hot rooding and racing worlds. A racer can have his car digitally scanned. Then, Woody can put the digital model of the car in his digital wind tunnel, analyze it and tell him or her what not to take to a real world wind tunnel. "We find the bad ideas first with a computer," he said. "That's much cheaper than finding it out at the wind tunnel." Woody can analyze anything that has to do with fluid flow whether it's air or liquid or whatever. Coolant flow through a cylinder head or airflow through a hood scoop can be mapped on the computer. "It doesn't matter if it's inside air or outside air or something commercial like a cranberry dryer," said Woody. "We can make all of these things work better by managing the fluid or air flows. It's about raising the efficiency of whatever device or devices you're trying to use. And if you have several devices (as in a multiple carburetion setup), we figure out how to get them to work together the way you want them to." This hood scoop on a Bonneville racing car didn't look pretty, but it upped horsepower after Woody improved the air flow through it. 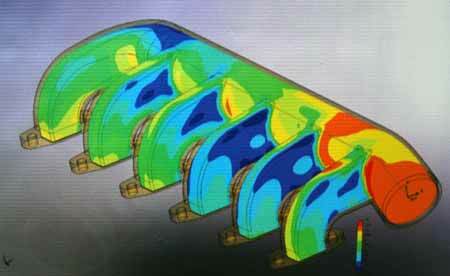 Using computer aided design (CAD) files and programs, Woody was able to illustrate the air flow patterns in this intake manifold. After a car or other item is scanned, a computerized scan file is produced. This has to be converted into a CAD file that can be put into a CAD program. Woody uses a CAD file called Solidworks, but there are other ones that can also be used. "As long as it's a CAD file, I can usually import it," Woody explained. "I may have to fix it up a bit. And, in the case of some specialty vehicles, we just take pictures and measurements of the vehicle and make a rough model just to get a base line. We're going to change it anyway, so we just need an idea of where the design is good and where it's bad." Once the base line is established, Design Dreams can start massaging the changes. These are then incorporated into the real car's final design in two or three variations. The car is then taken to the real wind tunnel to see if progress has been made. "The question is whether we are going to get the wind flow results we expect," noted Woody. "The results can tell us if the design is good." According to Woody, it is always a mystery as to what the final result will be. "I spend a lot of time thinking about all this, because you always hear anecdotal information about what worked for someone else," Woody explained. "You hear that this worked and that didn't or 'Joe said this' or 'Joe said that.'. Ninety percent of the time, what worked for Joe won't work for you." 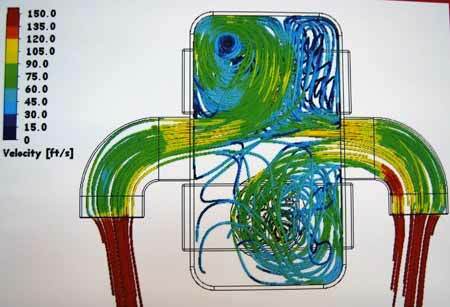 Woody said that results tend to be a mystery because, in most cases, air flow or fluid flow is very hard to predict. According to Woody, the technical name for a hood scoop is a leak. "You're putting this hole someplace in your hood and you try to turn the air flow 90 degrees or more and direct it to where you want it," he pointed out. 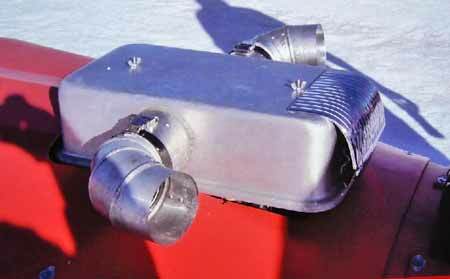 "You want it to go into your carburetor or manifold or throttle body, but it does a whole lot of things before it gets there. It doesn't want to turn 90 degrees, so you have to figure out how to persuade it to turn." Woody said that you want "even pressure and even velocity" for things to work well. According to him, with a carburetor you want the same pressure signal at every booster. "So, we work it out on the dyno and get your carburetors all set up — typically with a little stagger to compensate for the manifold (since it can't deliver everything) — then we put your hood scoop on it," he said. He warned that the wrong hood scoop design can actually hurt. "If you put the hood scoop on it and it completely destroys what you just did, that's not a good thing," he pointed out. "The engine will still run because you'll tweak it on the racetrack and get it to run, but you'll find you're losing horsepower. So, in order to get full benefit from adding a hood scoop, you'll need a pretty in-depth analytical process to visualize the air flow and get it fully optimized." Air is invisible, of course, but air flow can be mapped by a computer. If you put a cylinder head on a flow bench you get a cfm number that tells you how many cubic feet per minute are flowing at the point you're taking the measurement. A computer can measure the cfm at multiple points and map it. Carburetor airflows can also be mapped by computer and the drawings can be used to tune carbs or balance multiple carburetor setups. This drawing maps the velocity of airflow going into a supercharger. "The number either goes up or down, depending on what you do," Woody clarified. "So, that tells you what happened, but it doesn't tell you anything about why it happened. So, in the computer, what we do is still get that same cfm number and we can create a picture of what's going on and see if the cfms go up or down." Woody said that the graphic interface can color the air flow according to pressure, velocity or density. "We can see what the air is doing," he stressed. The pressure differential is what drives the whole process. All fluid flows from a high pressure to a low pressure and the velocity changes in-between those two points. If you color the flow and you look at it, you may all of a sudden start thinking about what's happening in ways that you could never imagine without Computational Fluid Dynamics. "That's the real value of CFD analysis," Woody said. "That's really more important than the ultimate accuracy of the analysis. Being able to spot trends is a big plus. In the old days, we would stick a flow ball down in the corner where we knew we needed to add material, but the flow ball actually disrupted the very measurement you were trying to take." The colors in the drawings the computer generates indicate different flows or flow rates. When you look at a system in terms of velocity, blue would typically mean low velocity and red would indicate high velocity. Pressure would map the same way, with blue indicating low pressure and red indicating high pressure. "It blends in as many colors of the rainbow as you want," Woody noted. "And sometimes it's actually better to look at it in shades of black and white, because black, white and gray actually give you better insight than the colors." 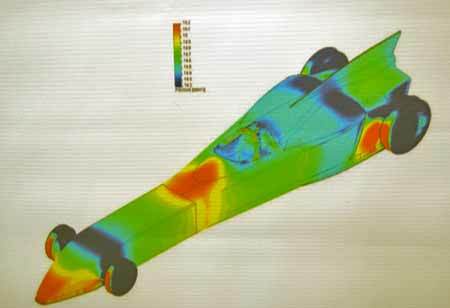 The design of a racing car such as this streamliner can be enhanced by analyzing airflow as a graphic interface created by computer. 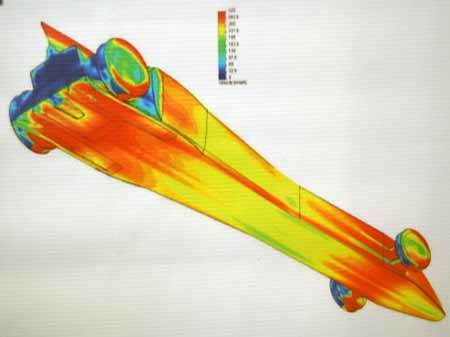 The flow mapping here indicates the aerodynamic characteristics on the underside of this racing car. 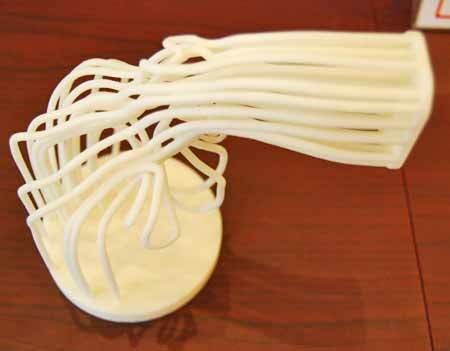 Woody has also started using a 3D printer to make models of fluid flows. "I realized that 3D printing was coming along and, at that time, I was working with a company that had a 3D printer," Woody stated. "So, I decided to try to plot the flow trajectories in a port that went into an engine and save those as curves that could be printed out with a 3D printer. I was the first person on the planet to do that and now several other companies have done the same thing." Woody's latest trick is mapping lines of air flow and using a 3D printer to create a three-dimensional model of the air flow. Woody said that the three-dimensional models give you better insight into air flow dynamics. "Instead of just looking at the flow on a computer screen, you can take the 3D model and roll it in your hands and turn it and look at the airflow in more than one dimension. It gets you thinking about your situation and you can see what's going on better and figure out how to improve on it." Woody said that there are samples of all his analysis on his Website and information about what he can do for anyone wanting to improve the horsepower of an engine or tune a racing car for maximum efficiency. "A lot of the postings there explain what the process is and show some typical results we achieved," Woody noted. "Almost every case is unique, like the cranberry dryer. 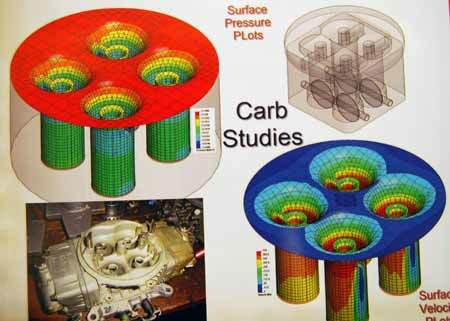 We can give people good insight into any process that involves fluid flow or air flow and show them things they've never seen before that improve engine performance or racing car design work."